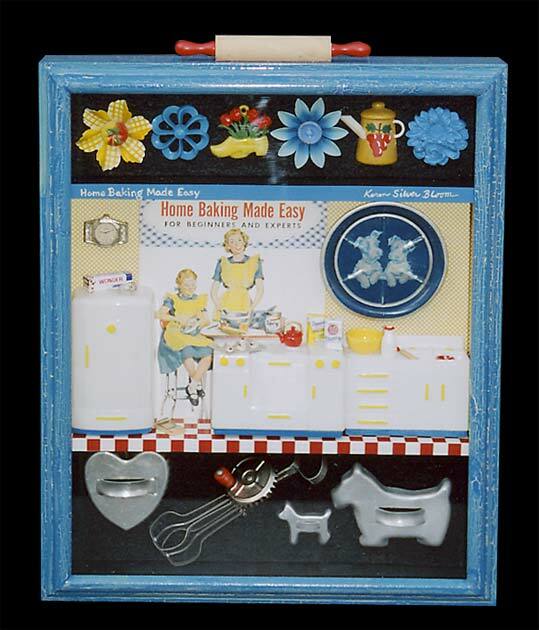 Kitchen curtain tie-backs and shade pulls, cookie cutters and a child's egg beater are used in the borders of this charming kitchen box. Mother and daughter are happily baking on the cover of this vintage recipe book and in their 50's kitchen. The frame has a blue and yellow crackle and the back of the box is covered with a piece from a vintage tea towel. A small rolling pin is perched on the top of the box.